The Fandom Club's purpose is to allow students to be able to express themselves, through the art of cinema and fandoms overall. The club will help students build relationships with peers, and will welcome all who wish to participate. 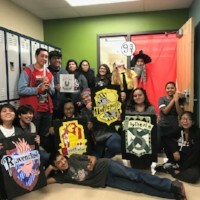 The overall hope of the Fandom Club is to form a community of students (and faculty if they also wish to participate) who share common interests and lifestyles through movies, video games, books, and television show fandoms.